Baking this Passover apple cake is a lovely tradition to share with your family. 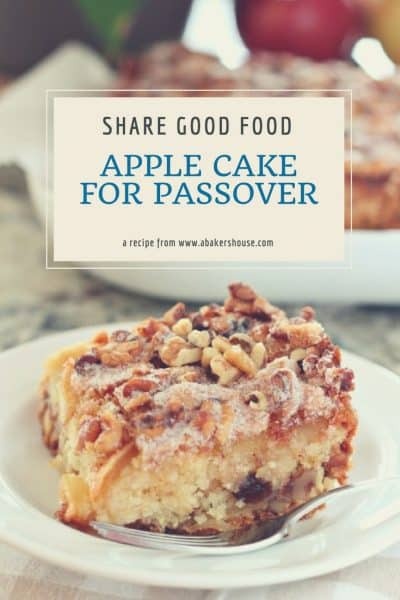 Layers of apples are baked with matzo meal and finished with a crunchy nutty and spice topping that create a moist apple cake which will become one of your favorite Passover dessert recipes. Mix the topping of walnuts, sugar and cinnamon. Set aside. Prepare the apples– peel, core and slice. Beat the cake batter until well mixed. Layer half the apples and half the cake batter. Repeat. Sprinkle on the topping. Do you have family favorites for Passover dessert recipes? Baking a Passover apple cake may be special for the time of Passover in the spring but really this is a good recipe for many occasions. This Passover dessert may be made with traditional or gluten free matzo. I wrote last week about baking some traditional Passover recipes for my friend to enjoy for her family’s Passover seder when I made coconut macaroons. (Seder is the traditional dinner that marks the beginning of the holiday.) 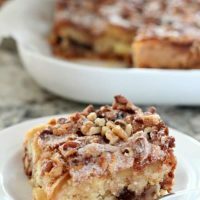 This matzo cake for Passover is another contribution to add more dairy free baked goods to the celebration of this Jewish holiday. I was astounded by the sheer volume of traditional Passover recipes that my friend was preparing for her family! 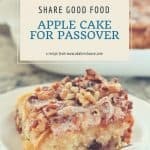 Easy Passover desserts like this apple recipe and this flourless chocolate cake will save you time so you can get back to preparing the rest of the Jewish feast. 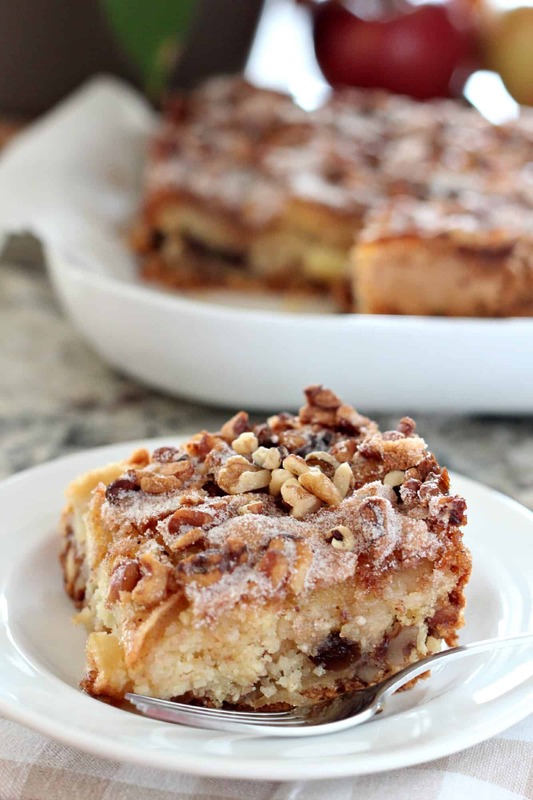 This easy apple cake could start your day for breakfast, be served as an afternoon snack or show up on a dessert table at Passover or any time of year. Passover is the Jewish holiday that celebrates the freeing of the Israelites from Egyption slavery. The dates of Passover vary year to year but the holiday is observed in the spring. What are dietary restrictions for Passover? Foods that contain wheat, barely, oats, rye or spelt that have come into contact with water are called chametz (source here) and are not permitted during Passover. An unleavened bread called matzo (or matzah or matza) is traditionally eaten during Passover. Matzo is a flat bread similar to a cracker. Matzah is made from a mixture of flour and water. 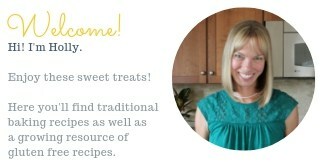 I bought gluten free matzo for this recipe. Ingredients in the Manischewitz brand of gluten free matzo are based on potato flour and potato flakes along with other ingredients. What is the difference between matzo meal, matzo cake flour, and matzo farfel? Matzo meal and matzo cake flour are the same thing– both are finely ground matzo. The difference is the texture. I’ve read some articles that suggest that matzo cake flour is the most finely ground consistency of matzo. For example, you could sift matzo meal and create matzo cake flour. Or you may use the two interchangeably. You can buy matzo cake meal or matzo cake flour from Amazon or at the grocery store. Or you can simply use a food processor to grind sheets of matzo into a flour-like consistency. Gluten free matzo cake meal is also available online as you’ll see here. Matzo farfel is matzo that has been broken into small pieces but not finely ground. What’s the difference between Jewish apple cake and Passover apple cake? Jewish apple cake has become known and loved by people of all faiths and is not only a cake for celebrating Jewish holidays. Most often Jewish apple cake is baked for a Rosh Hashanah meal which marks the Jewish new year in September or October, depending on the year. This type of Jewish apple cake is dairy free and contains oil as a central ingredient. Wheat and leavening agents may be used in Jewish apple cakes. The unique feature of the Passover apple cake is that it does not contain leavening agents or chametz as described above. The unleavened matzo is layered with apples and spices to create a moist and dense cake. The walnut topping gives a nice crunch to the top. 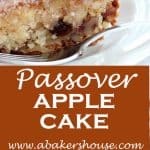 The apple cake recipe I am sharing is Arthur Schwartz’s recipe for Passover Pareve Apple Cake. Baking with matzo cake meal was new to me and I wasn’t sure if I had gotten this recipe right at first– until I shared it with my friend who gobbled it up and kindly erased my concerns. The cake has two generous layers of apples and raisins which are right at home in the matzo cake meal batter. The raising as optional. Other fruits that would be nice in this cake include plums or pears. The cake topping of spices, walnuts and sugar is the perfect crunchy element to pair with the soft cake and baked apples. Top your apple cake with a few more walnuts before serving for presentation. Some cakes improve with time and this apple cake is no exception. Leave the baked apple cake in the pan until you are ready to serve it. The flavors meld and taste even better the second day. Serve warm or at room temperature. Make this flavorful apple cake for Passover or swap out matzo flour for all purpose flour for other occasions throughout the year. Preheat the oven to 350 degrees F. Spray an 8 inch square glass pan with oil. First, make the topping. Mix the walnuts, sugar and cinnamon in a bowl. Next, work on the cake. Beat the eggs until light and fluffy. Slowly add the sugar (do not dump in all at once). Add the oil and then the matzo flour. Now start to layer the cake. Pour about half to two thirds of the batter in the pan. Scatter some of the topping over the batter. Gently lay half of the apples over top. If you are including raisins, add all of them now. Cover with the batter you have left. Layer the remaining apples over the batter then add the extra topping on top. Source: recipe from Arthur Schwartz. Only change is to reduce sugar from 3/4 cups to 1/2 cup in the cake batter. Leave the cake in the pan until you are ready to serve it. Are you on Pinterest? I am! Join me there and save this pin to your boards. This apple cake recipe is one I’d like to try again with all purpose flour or with gluten free flour to see the difference in taste and texture. I hope you can enjoy Mr. Schwartz’s recipe this Passover with your family. Do you bake apple cake for Passover or what baking traditions do you share with your family for Passover? Oh Barb, I’ve had so many slices of this and that to share with you…but your doorstep has moved just far enough away that it is not an easy drop by. Let’s change that and find a time to get together soon. Kids are out of school in 6 weeks so we should find a time before summer chaos hits my house. I’ll be in touch. Thinking of you tonight knowing you had such a sad day. What a thoughtful (and delicious) gift for your friend. How can anything that looks so mouthwatering be anything but fabulous? I do wish I had a slice too. Baking for others is such a nice part of this blogging experience for me– I always have more desserts than I need and I am so happy to share. This time was a bit different as I made a dish with which I wasn’t familiar so it felt strange to share something I did not know if it tasted just right or not. My friend smiled and kept eating so that was a great sign! OMG! This is similar to the one I use and it is a great cake! I always debate making this for Passover because there are so many good things to make. Sometimes I make this for Rosh Hashonah because apples are traditional then and it doesn’t matter that you use matzoh meal. Great job, Holly. Sorry, we will miss you tomorrow. I’ll write more to you later! I am going to keep Rosh Hashonah in mind for this cake too, Abbe, thanks. I am awfully sorry to miss your lunch tomorrow. Another time for sure. Thanks again for the invitation! Hope to meet up soon. A delicious and thoughtful gift for your friend. I am learning about new traditions (new to me) through your blog. Hope to see you soon, Holly.will miss you tomorrow. Yes, I’ll miss seeing you all tomorrow too! Enjoy the great company and wonderful food! I’ve got a counter full of apples that need to be used and was thinking about making an apple cake. Voila. Looks delicious Holly. What a lovely cake, Holly. I love the topping! You forgot to tell us what to do with the remaining apples. Oh goodness, I certainly did! Thanks for letting me know. The apples are added half at a time to create layers. The recipe should be updated now to show those steps. Thanks again for letting me know. I really appreciate it! Have you tried using all purpose flour? I haven’t tried all purpose flour but intend to. Let me know if you give it a try! Hi, I haven’t tried substituting almond flour but am interested to hear how it works. I think it might work well. When there is less than one cup of either all purpose flour or other type of flour (here it is the matzo flour) I find almond flour to be a good substitute. Can I make ahead of time and freeze? Hi, I haven’t frozen this cake myself but think it would freeze well. There is no icing or other dairy product that would interfere with successful freezing and defrosting. Wrap the cake tightly in two layers of plastic wrap then in aluminum foil or a Ziploc freezer safe bag. Freeze then defrost overnight in the refrigerator. Question. Does this cake freeze well? I was hoping to make it in advance! I made this exactly as stated and the batter is super thick and hard to spread around; impossible to spread on the top. I could only put a couple of dollops on the top. Is this normal? Maybe with almond flour it would be less thick? Hi Michelle, the batter will be thick but shouldn’t be tough to spread. It’s hard to say why your batter was super thick, but I think you had the right idea by putting dollops of the batter on top. How did it turn out? Thank you. I was going to ad another egg to the batter but I didn’t want to make any mistakes. I’m putting it in the oven now. Will keep you posted!